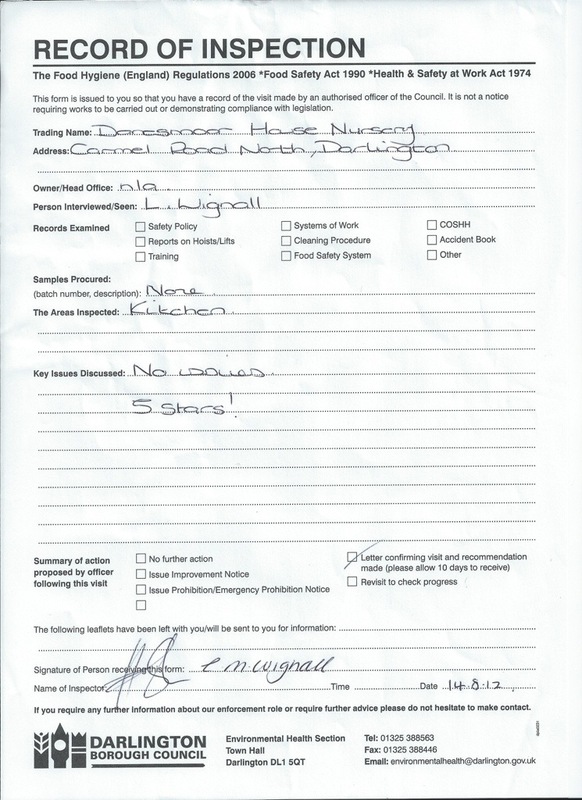 Today we received our routine visit from the environmental health team and were awarded 5 star status. This is an important benchmark for us because it enables us to say with confidence that our hygiene, preparation and cooking methods and control measures all go towards keeping the children in our care safe as well as healthy. Our recipe is simple, cook what is needed on the day minimising waste and get rid of any left overs. Parents can view our food policy in Linda’s office as well as all our other policy documents. Meal times are an important part of the day when the children at Danesmoor House Day Nursery get to sit together and share a social experience as well as eating a balanced nutritious meal. We meet all children’s requirements and request that if there are any diagnosed food allergies or intolerances that we are informed as soon as possible so that we can amend recipes and menus if required.